DESIGNER ROOM RECREATE: BLENDING THE OLD WITH THE NEW! Was out to dinner just last week with friend Kristi Bender who is a partner at Wendy Schwartz Design here in Los Angeles (Kristi was with the group when we went to that restaurant that wouldn’t serve us carbs!). 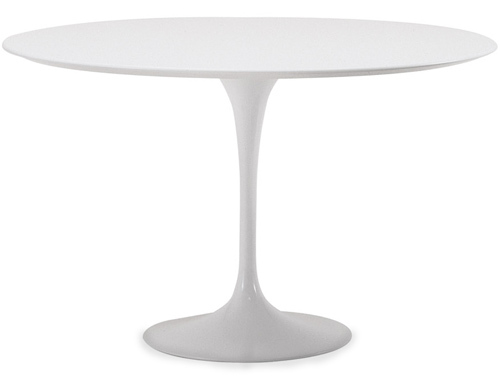 Whenever there is a group dinner and Kristi and I sit next to each other we can’t stop talking design. Love her. Or maybe I think it is “we” but it is just “me” who can’t stop talking about design and Kristi indulges my obsession by chatting with me. Anyhoo00, the other night we were out and about town with a group and we got to talking about Wendy Schwartz who helped design Kristi’s house and who Kristi is now partnering with in an interior design firm. They do all kinds of wonderful modern interiors that have a cool eclectic vibe. When I got home that night, I remembered seeing photos of Kristi’s dining room and I thought…”I must feature this on COCOCOZY”. So I wrote to Kristi and she sent along these delightful photos and great resource information. Kristi and her family live in a Tudor home in Hancock Park. The dining room project was a fun challenge because Kristi wanted to work around the dining chairs she and her husband inherited from his parents. 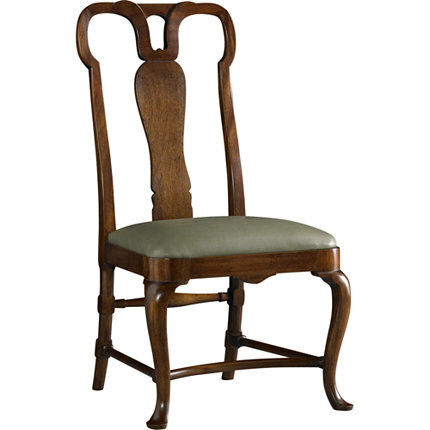 Very traditional chairs…Chippendale chairs…something you might see in a very old English style home. 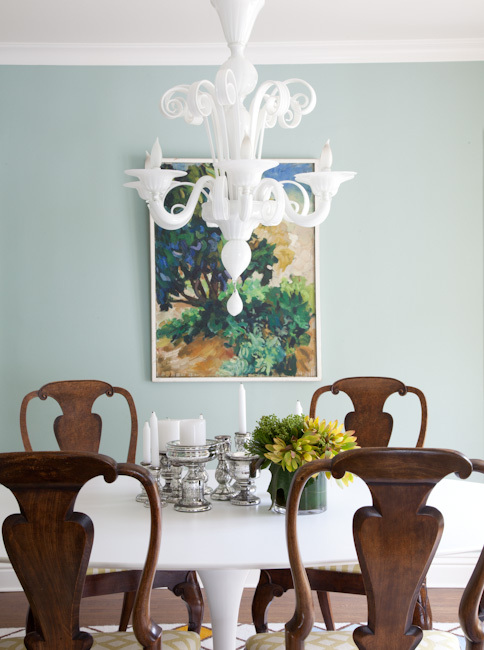 Well Wendy and Kristi kept the chairs pretty much as they were but then artfully painted a room around them…filled with mid century modern pieces, some classic reproductions and even a rug from my design crush Jonathan Adler. Love this living room. Perfect blend. New traditions and old traditions combine. So today…after many many months of not doing one…I am bringing you a DESIGNER ROOM RECREATE! 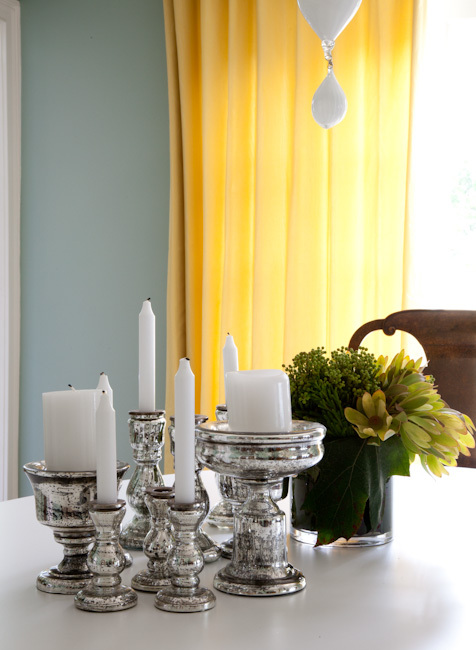 Here’s how you can get the look of this room too! What do you think of this dining room? 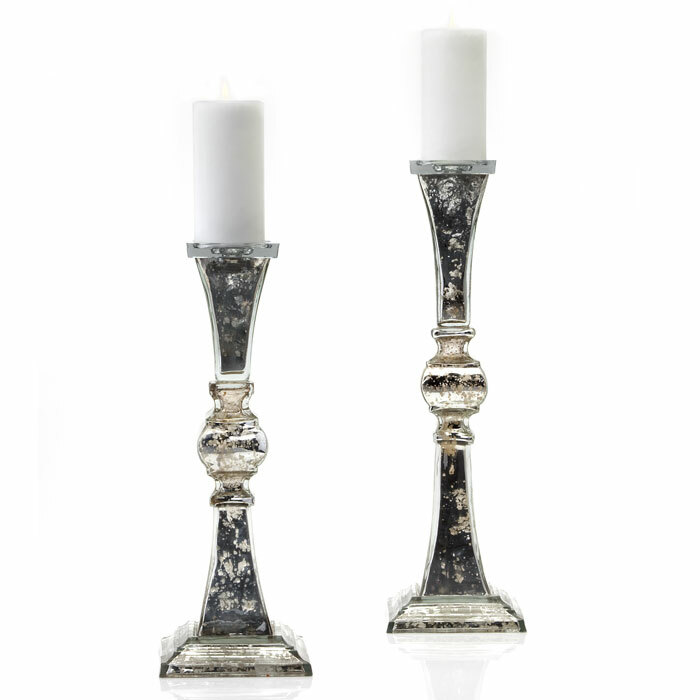 What pieces might you include in your home? Anything inherited in your space that you’ve worked around to create design magic? P.S. Please excuse any typos and missing curtain match…am running and will fix later! obsessed with that rug – good choice! I love this space minus the area rug, and have in fact inherited some vintage pieces myself I am working on. Thanks for sharing! Thank you COCO COZY for sharing Jonathan Adler’s Magic Carpet rug. My mom has been searching for the perfect rug for her new little beach bungalow. I’m thinking this might be the perfect magic carpet!! love the green wall and the candle sticks! I LOVE that chandelier! She did a great ob mixing old with new….my favorite thing to do, but often not easy to master! Coco, I adore the chandelier, the chair fabric and those vendome Pillars, very unique. 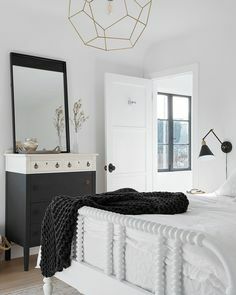 i think the mixing of classic older pieces with more contemporary pieces look great.. its brings more interest and warmth to the room..
My gosh, this room is awful. It stinks in the name of a well decorated room. You asked for comments, and this is mine. 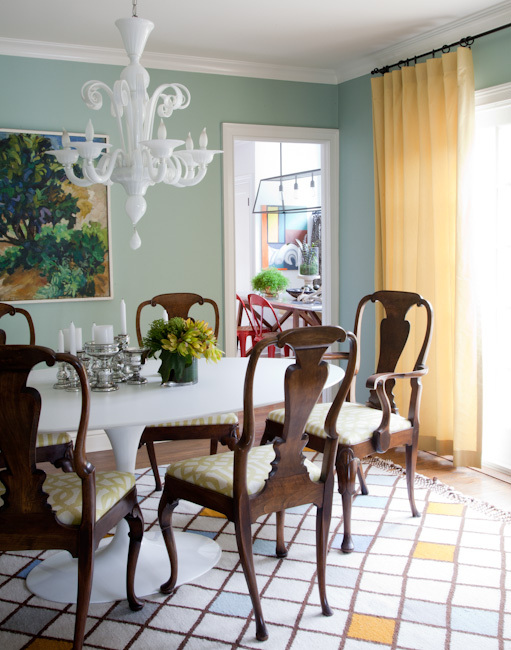 Love the Schumacher fabric, wall color and sure, I’ll take the Murano glass chandelier! A very refreshing space! I am not a fan of that room either, I have to tell you. It looks like an experiment. I like the magic carpet rug in a different setting – all white? That could be very fun. I do love your stories about all those decorating luncheons and escapades though! Sorry to your friend. This post was just what I need for affirmation. I am redoing the first floor of our 100 year old home and taking it from very traditional to something a bit edgier. I, too, have very traditional dining chairs that I am working with. I can’t even say I inherited them though. I bought them. Spent more that I should about ten years ago for them, but I also have ten of them so I need to live with them awhile longer. It was interesting for me to see how she made this work. I am hoping that with a more modern wall color, updated fabric on the chair seats, and a new rug that I can transition my space too. We’ll see. Thanks for sharing these great images. Are you kidding me? How perfect is this room!!! The rug is amazing and I would have never thought of those yellow/gold curtains to go with that wall color but now that I see it together, I have a pair that same color and will be pulling them out of the closet lol…Love your blog, great stuff!